This setting allows you to use an account common to all Amazon orders or an independent account for each customer. It is possible to add conditions to Prestashop that are closer to the ones used by Amazon. Configuration for overwriting shipping costs. See the “Article record” section for more details on this subject. If you have several shipment methods configured in your Amazon back-office (for instance, Standard and Express), it is possible to configure, through the module, a link between the shipping methods configured on Amazon and the ones used in Prestashop. This way, you will see the associated shipment method within the order record in your back-office. This allows you to obtain better quality information for the invoices generated afterwards. In order to avoid “invading” the product sheet, marketplaces are found in sub-tabs. You just need to click on + or – to display the menu linked to the marketplace. 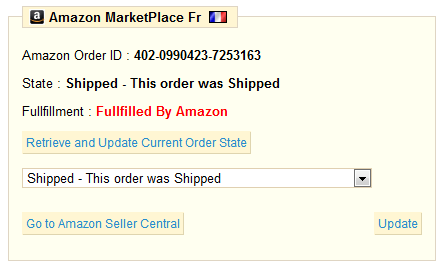 When the marketplace has several platforms, like on Amazon, each platform configured in the module is represented under another sub-tab such as “English” and French” below. It is now possible to configure shipping costs for each article. Default shipping costs configured on Amazon are thus overwritten by the shipping costs found in the product record. To the store: shipping costs will affect all products in the store. To the category: shipping costs will affect all products in that category. Possibility to enter 0 or to leave this empty. This is not the same thing at all! When set to 0, shipping costs will be free; when left empty, Amazon rules apply. New propagation : you could propagate options to the Category, the Shop, or the Manufacturer ! Extra options when importing orders, addition of a button to “See order in a new window”. Extra options for listing orders, orders that have been previously imported are now clickable and the order can be opened in a new window. Force order import even if the product is out of stock.